Oakstrong Martial Arts – instruction with experience and passion, following tradition, enjoying the workout, making people safer, and sharing the joy of success. Leveraging more than 35 years of training, Oakstrong Martial Art’s instructor Neville Loberg’s teaching combines his skill in karate and self-defense with his sincere passion for teaching. He believes in the power of positive reinforcement, and that all students can achieve great benefits each unto their own ability. His goal is to assist in every student’s growth in confidence, physical well-being, and mental focus – all while enjoying their training. Discovering the martial arts during his first year of college, Kyo Sa Loberg has studied a wide range of karate-do systems, principles, and philosophy. To make people safer, his studies of self-defense strategies and techniques are bit of an obsession. 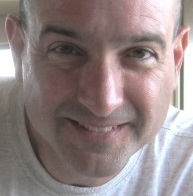 In addition to his martial arts teaching experience, he has also sharpened his instructional methods as an educator in the high-tech industry for over 25 years. After many years he continues his instruction of adults and young adults in the Santa Cruz region. Signing up for classes as a college freshman in 1982, one of the few physical education classes still available was an 8am karate class. In just a few classes, he was invited to train at the instructor’s personal studio, showing a natural understanding, ability, and talent in the art. It was the start of a passion and a path in life. 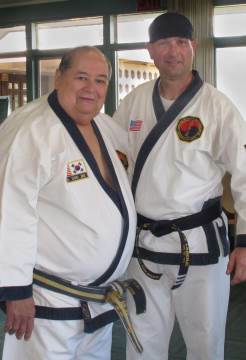 In the following years Mr. Loberg went on to study Tae Kwon Do, Aikido, Kenpo, self defense, and other karate styles. 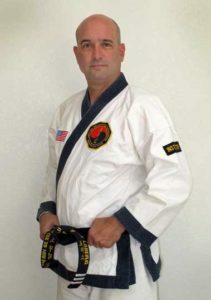 In 1995 Mr. Loberg dedicated his training to the traditional Korean martial art of Tang Soo Do, accepted as a student of Grandmaster Andrew Ah Po in Sacramento, California. Himself a student of Tang Soo Do founder Great Grandmaster Hwang Kee, Andrew Ah Po was appointed as a charter member of the original U.S. Soo Bahk Do Moo Duk Kwan Federation formed in 1976. He is considered one of the founding fathers of Tang Soo Do in the United States. Over the years as a student of Grandmaster Ah Po, Mr. Loberg excelled at the art, earned senior black belt rank and took on teaching assignments as directed. Beginning in 2010 Mr. Loberg lived and worked in The Netherlands, where he continued his martial arts training and teachings – befriended by the martial arts community in Holland. 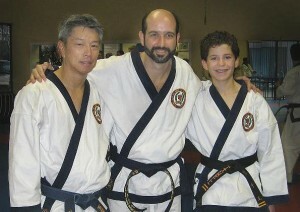 Upon returning to California in 2014, Kyo Sa Loberg continues to train and teach Tang Soo Do. He remains true to the principles and art of Tang Soo Do as taught the founder, the late Great Grandmaster Hwang Kee and carried on by Grandmaster Ah Po. In addition to Tang Soo Do, Neville Loberg’s other passions include travel, music, hiking/training in the forest and a deep love for his family. 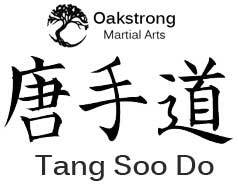 Oakstrong Martial Arts is a member of the Tang Soo Do Martial Way Association under the leadership of Grandmaster Andrew Ah Po.